The barber turned me in the chair to face the mirror. He put a hand to either side of my head. He positioned me a last time, and then he brought his head down next to mine. We looked into the mirror together, his hands still framing my head. I was looking at myself, and he was looking at me too. But if the barber saw something, he didn’t offer comment. He ran his fingers through my hair. He did it slowly, as if thinking about something else. He ran his fingers through my hair. He did it tenderly, as a lover would. That was in Crescent City, California, up near the Oregon border. I left soon after. But today I was thinking of that place, of Crescent City, and of how I was trying out a new life there with my wife, and how, in the barber’s chair that morning, I had made up my mind to go. I was thinking today about the calm I felt when I closed my eyes and let the barber’s fingers move through my hair, the sweetness of those fingers, the hair already starting to grow. While to my surprise this blog was included in Abitare’s must-read list for the beginning of 2011 – courtesy of Fabrizio Gallanti – it is also rewarding to see that “writing architecture” is really making it to the current architectural agenda. Yesterday, for instance, the coming director of Domus, Joseph Grima, has just hosted a debate on “Critical Futures” at The Gopher Hole, in London. The usual suspects have expectedly wrapped up the current discussion opposing traditional media to the blogosphere, and “legitimate” to “emergent” modes of criticism. And while next month I’m also suspiciously flying to Canada to participate on yet another debate on the practice of “writing architecture” – to be held on the 10th February at the CCA, in Montreal –, from the other side of the world an academic journal just landed on my desk which addresses this very same subject. From the somewhat dominant feminist perspective to the less “respectable,” yet increasingly attractive, popular domain of the comic novel analysis, or from another revision of Tafuri to the now inevitable revisit of the increasingly appreciated “little magazines”, the edition covers a lot of interesting ground, while it keeps good track of many backdrop discussions in the field. After all, it must be noted that if there is something in which academic writing is fertile it is in offering “references.” And if it is good, as is generally the case in this instance, academic writing will also at least offer some novel, personal insights into that vast, loveable yet anxious archive of what one can call influence. Faced with an apparent, ever-lasting crisis of architectural criticism that ultimately and hopefully may prequel this activity’s rebirth, issues of the conventions – and subsequent relevance – of what gets to be written, still seem what people should be concerned about, and what Beyond was lead to question with its “experimental” take on the fictional approach to writing architecture. And this justly leads me onto another book that was awaiting my proper attention in between piles of relevant information debris. 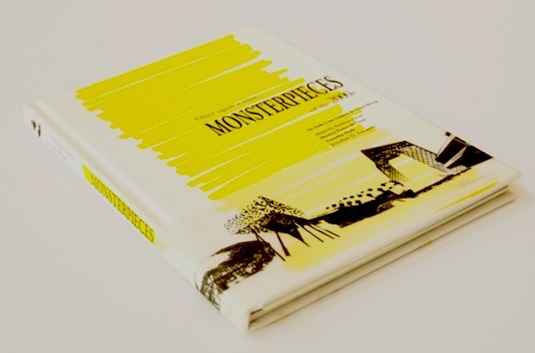 In my opening editorial for Beyond I had already spoken of “a passion for concise story-telling” and Once upon a Time… Monsterpieces of the 2000 is probably the first book in recent times to bring this notion forth to its next level. Taking as their starting point “the major works of a generation obsessed with architectural form,” as invited essayist Jonathan D. Solomon puts it, at their best young authors and recent Harvard graduates Aude-Line Duliere and Clara Wong provide wonderfully crafted micro-narratives that ironically twist your usual, expected description of a building. As if entering the realm of archeological fiction, Duliere and Wong’s conflation of narrative illustration with profoundly mad tales directly enters the realm of my present interests: to understand how absurd narratives actually provide a more open, cultural deconstruction of architectural objects. These alternative writing strategies may prove especially appealing when the objects we’re talking about can no longer claim for a proper meaning within the crumbling critical systems in which specialists are left talking amongst themselves… And will eventually get bored stiff doing it. To start a new year – 365 whole new days ready to be wiped out, like a dear friend used to say – there’s nothing like a rebirth. So, as I have accumulated newspapers’ première issues for quite a while, this seems to be a pretty decent moment to go into this apparently resurgent medium. It’s not that newspapers are here to stay, at least as we know them, but during this year the specialist newspaper kind of re-emerged for its own brief, highly expert swan’s song. As such, celebrations like the one Mimi Zeiger of Loud Paper reported a couple of weeks ago are also fit for this particular zeitgeist. Going one year back into an old newspaper can be painful. I can assure you – I dug into 15 years of the Portuguese daily Público to write the book I’m soon launching and I can assure you the whole experience can be a weird trip. There are funny things, of course. The way style is so unflattering after only one season, for instance. But mostly you just feel the passing of time like the excruciating flattening out of whatever seemed important at certain instants onto an indistinct, mishmash passé. These were my unbecoming thoughts as I was quickly going along Panorama, a Spanish architecture newspaper that published its second year first issue (and possibly its last) in January-February 2010. The sensation of microwaved dejá vu was unsurpassable. Panorama takes the concept of a quick news section, like adopted in Pasages or Mark, onto an unexpected level of emptiness. What I initially thought was only its starting section – Zoom – spread cancerously to fill the whole paper. A sort of bloggy superficiality entirely made of press releases, but without the hyper links and the unexpected connections. Given the respectable weight of their subjects, the interviews at least promised some juice. After the lighter than light caressing of Toyo Ito and Valerio Olgiati’s egos, however, I only became enlightened on how to turn high profile content into surface scrap. At some point, I even became suspicious that Mr. Olgiati was a superficial chap after all. Which would seem unjust. However, there was something in which this shallow Panorama was still truly revealing. It was able to boast the amazing average quality and high level of experimentation in recent Spanish architecture, at least while the boom lasted. Then the bubble burst and these vistas became instantly archeological. Auspiciously, in these years of print crisis architects didn’t return to newspapers only for the cheap paper. The New City Reader, launched October 6th 2010 by Joseph Grima and Kazys Varnelis, and London’s MAP – Manual of Architecture Possibilities, set in 2009 by David A. Garcia, are more strategic on their retakes of the newspaper – or newsletter – format. The NCR’s first issue was a most graphic statement opened and closed by Kazys’ succinct and yet historically succulent editorials. With its contents driven by Kazy’s doppelganger lab at Columbia, its theme is a cautionary one-off story, a specific happenstance in the life of New York and all the stuff that surrounded it. It is an historian’s take on the medium, full with deemed reflexivity. Unlike the NYCR insightful return to its own city’s past so as to produce a fresh take on the megalopolis’ present, MAP’s initial issue took flight from the present-day urban mess into the cold, welcoming steppes of tomorrow, visiting this period’s ever-fashionable Antarctica. And after the research data comes the “encyclopedia of the future,” and also the barely fictional projects for the new colonization, courtesy of Garcia’s studio. It’s a practitioner’s take on the medium, full with deemed reflexivity. The last of new newspapers I managed to grab lately is Pie. Out of distant New Zealand, Pie, just like MAP and the NYCR, is quite a conceptual object. While responding to the motto of Repetition, Pie’s issue #01 sequence is so amazingly curated that you may start playing with the word ‘sequence’ in your mind, turn the page and… find a small ironic article on Fibbonaci. Being an art newspaper that is also artistic, Pie favors a medley of stories over the traditional information mosaic. After an article on Kyr Royale’s human copy machine performance, you’re also naturally bound to bump into the amazing images of North-Korean mass choreographies. An authentic page-turner. Pie alters your aesthetic and graphic notion of what a newspaper is supposed to be, and that is already something else. But it also offers you the notion that ‘news’ themselves are claiming for a much-needed resumption. The stories are short, but unlike in Panorama they are masterly crafted into maximum, spin-wheeling content. More like a 1000-character Twitter with its own permalinks. As I have started to heavily suspect, beyond politics, economics and our somewhat stale social world, maybe indeed the (fortunately expanded) field of art is the only one that is still able to produce interesting ‘news’ – new ideas, new concepts, ever new ways of holding up reality to take a good look into it. Jim Allen’s piece NEWS reflects the dilemma in which we are stuck. To be caught in the web of opinions with no other value than to keep the communication alive, and the want for a truth that would cut through that web, the need to live in the human web and the desire to go beyond. There is no conclusion to be drawn out of Jim Allen’s piece. The only thing we can do is to take seriously what we observe: a certain kind of anger and melancholy, desire and despair, hope and sadness.